As mentioned before, the architectural details covered here are base on real customer integration solutions using open source technologies. The example scenario presented here is a generic common blueprint that was uncovered researching customer solutions. It's my intent to provide a blueprint that provides guidance and not deep technical details. 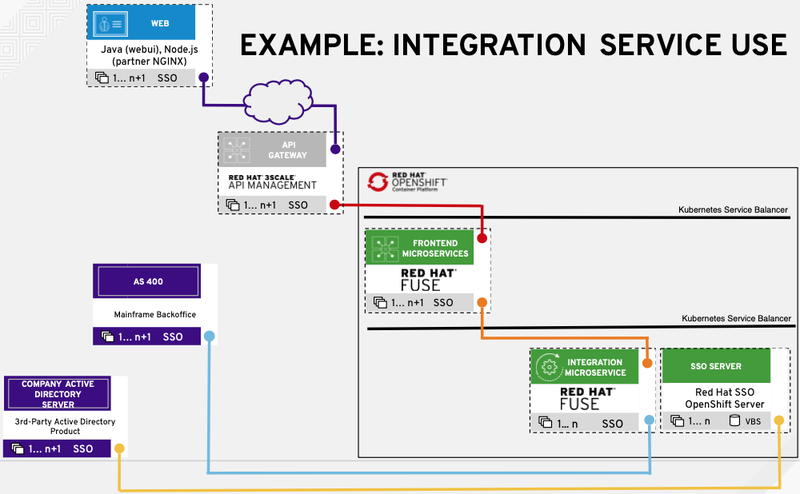 The example blueprint shown in the figure titled Example: Integration Service Use outlines how to integrate microservices in to your architecture. In this example, starting from the top, an online application is used to connect to your services through an API gateway. 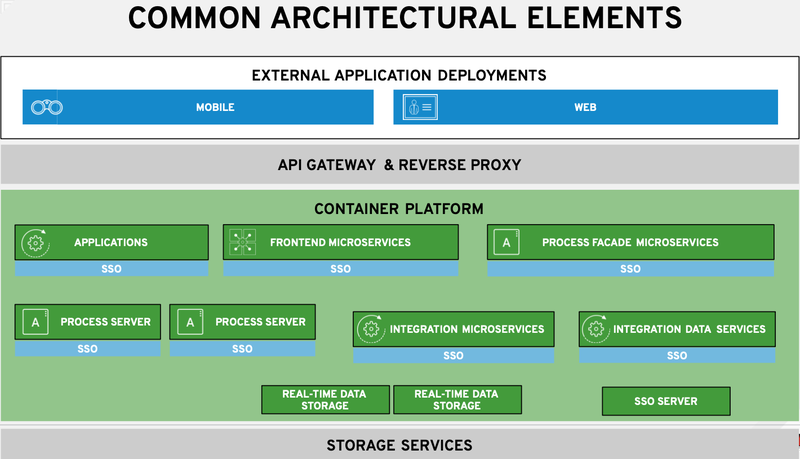 It's leveraging a group of microservices that provide frontend functionality. These frontend microservices are gathering data and information from the various organizational backend systems by working through integration microservices. The showcased backend system in this example case is a mainframe. While there is no direct link between the various internal microservices to security services, it's implied by showing the authentication and authorization services supported through Single Sign On (SSO) server. This SSO server is leveraging existing organizational choices that involve using a third party active directory solution. It's crucial to understand that SSO functionality is pervasive throughout the integration use cases, so consider it included as plugins for every service artifact in the architecture blueprint. There is a conscience effort here to keep this blueprint example as concise as possible, therefore the integration of various potential backend systems has been simplified to a single representative box. 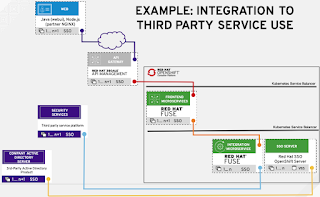 While the above blueprint shows service integration within your own organization using open technologies, what about legacy third party service implementations? Many organizations are forced to live, at least for the time being, with legacy choices and have service integrations that need to tie in existing technology platforms. 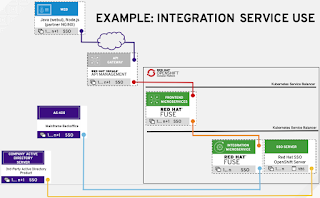 With open technologies like Red Hat Fuse, it's like having a universal tool for connecting to almost any technology. 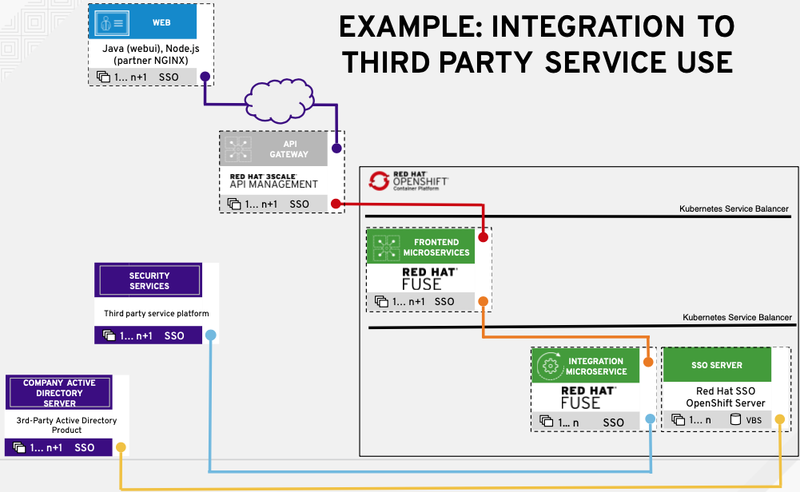 The example blueprint shown in the figure titled Example: Integration To Third Party Service Use outlines how to integrate your organization with third party services in your architecture. In this example, starting from the top, an online application is used to connect to your services through an API gateway. It's leveraging a group of microservices that provide frontend functionality. These frontend microservices are gathering data and information from the various organizational backend systems by working through integration microservices. The showcased backend system in this example case are a set of security services that have been implemented on a third party platform using proprietary technology. Have no fear, you can enable the services they provide in place by fronting them with a set of integration microservices. This enables your development organization to deliver agile and flexible applications without having to rip and replace large parts of your existing architecture. Next in this series, we start taking a look at more specific integration architecture blueprints that tie in all the elements we've discussed as part of a specific case in an architecture for omnichannel customer experience.